A police vehicle at Fraserburgh harbour. 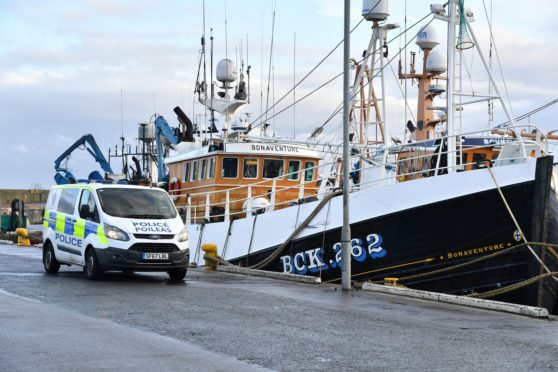 The body of the sailor was pulled from Fraserburgh harbour in the early hours of Thursday morning. Police divers made the recovery after a major search and rescue operation involving the RNLI, Coastguard, police and a helicopter. It is understood the man fell into the water as he was trying to board the Buckie-registered trawler Bonaventure. Now the Marine Accident Investigation Branch (MAIB) have revealed they are working alongside police and the harbour board as they continue to work out exactly what happened. Officials from the MAIB said they will decide whether or not to probe the death “once we know more”. A spokesman said: “We are liaising closely with the local police and harbour authority to establish the facts of the accident. Many of the crews working out of Fraserburgh and other north-east ports come from the Philippines. One Filipino man working on another boat said: “The harbourmaster told me about the Filipino man who fell into the water this morning. Police have said they are continuing efforts to trace the man’s next of kin.